These colors display a gravitation toward calming colors derived from nature with a twist of energy. Rose Quartz reminds us to reflect on our surroundings during the busy but lighthearted spring and summer months. A maritime-inspired blue, Snorkel Blue plays in the navy family, but with a happier, more energetic context. The popularity of this brilliant hue (Green Flash) is representative of nature’s persistent influence even in urban environments, a trend continuing to inspire designers. Amped up versions of Limpet Shell and Rose Quartz are the perfect palette for this eclectic living room. Going big with a bold color pays off when paired with warm woods and soft neutrals. 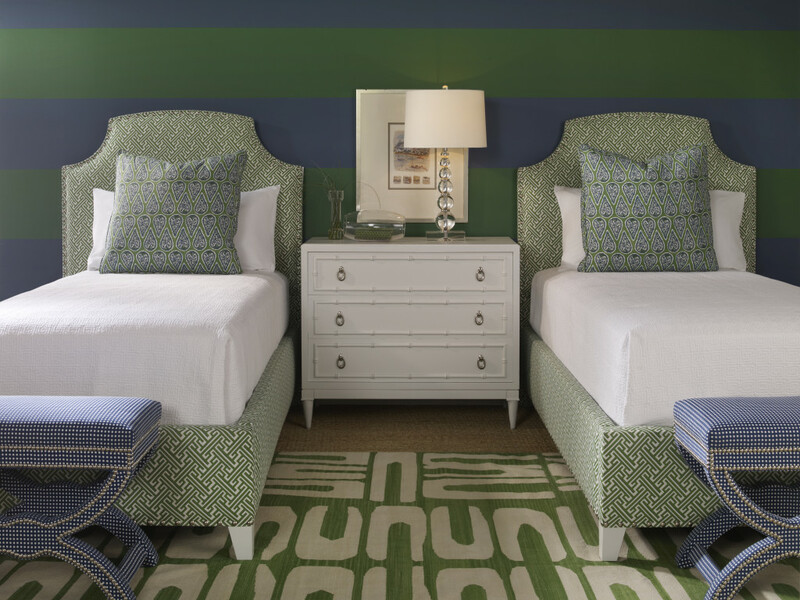 Stripes and prints in analogous tones of Snorkel Blue and Green Flash create a harmonious and tranquil color scheme for this guest bedroom. Add crisp white and English Colonial-style dresser for a traditional English aristocratic feel. Accents of Green Flash add some perk to this modern, white room. Floating shelves and cabinet doors are the perfect places to add pops of this bright color — it brings the outdoors in. This sunny print chair is a fabulous pick-me-up for any room. Use the matching pillow or choose a complementary one in Serenity or Snorkel Blue. Lilac Gray furnishings look great against a cool gray backdrop and with cool gray accessories. Hints of antiqued brass add warmth to this living space. Choose striking patterns for pillows, upholstery and drapes. Two analogous shades of blue — Serenity and Snorkel Blue — provide a backdrop for a complementary hue like Fiesta to pop right off the cloth. Punchy versions of Lilac Gray- and Fiesta-colored glassware create a beautiful tablescape for the dining room or a side table in the living room. Need help decorating with spring colors? Contact Beautiful Habitat to start your home makeover today.